Nowadays, companies are becoming more and more competitive. With that being said, the likelihood of wanting to protect company properties is of high importance to ensure that your competition will not have an idea about your future plans and common strategies. One good way of protecting your company’s trade secrets would be to have your employees, contractors, and consultants sign a business non-compete agreement. 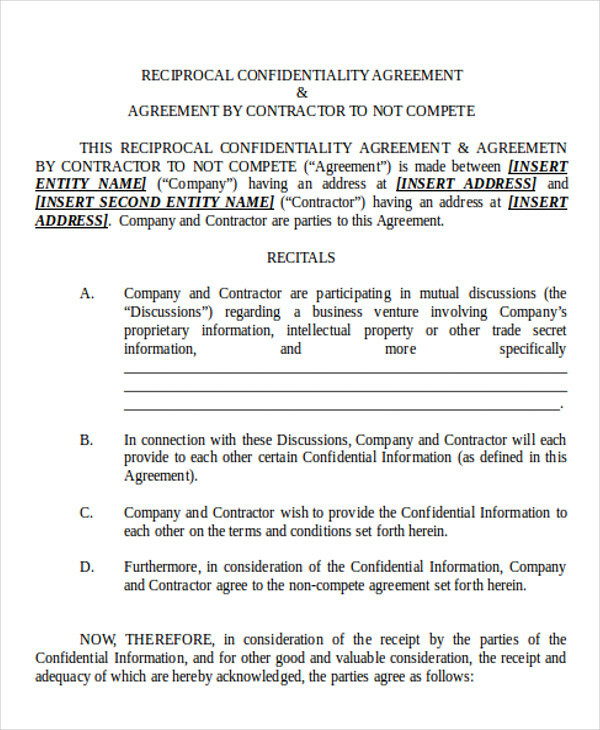 It would be a good idea to have a template for this agreement lying around to ensure that you are always prepared and that you can easily issue one once an employee, contractor, or consultant chooses to end his/her connections with your company. If you have yet to come up with one, it would be a good idea to secure one now. We are here to help you out by sharing a couple of tips that would make coming up with said agreement a whole lot easier. 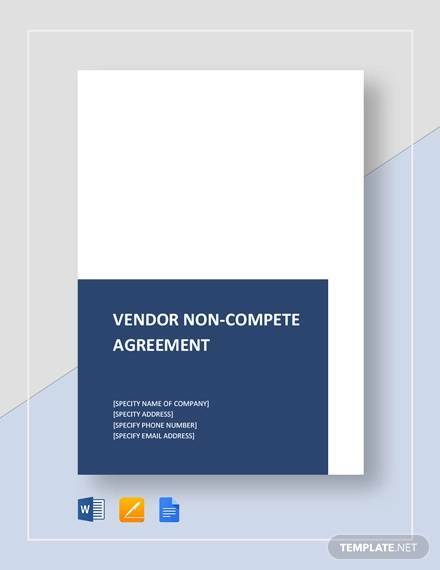 We also included sample non-compete agreement templates to download for free from this very article. They are of high quality and they come in different contract agreement formats so you definitely have a lot of choices. 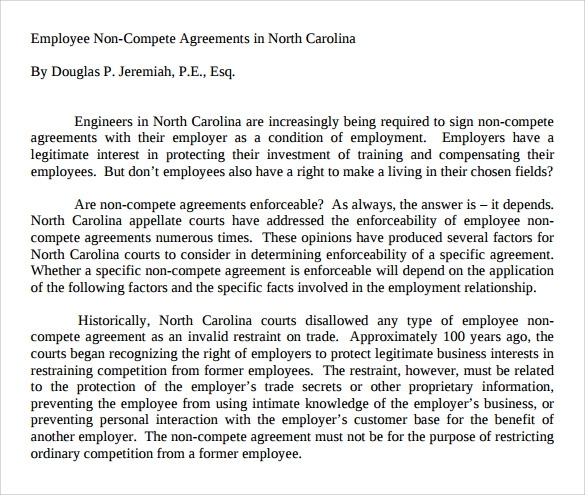 If you are ready to find out more about non-compete agreements, just scroll down and read up! Employers issue employee non-compete agreements to employees when they decide to leave the company or during the employee onboarding process. 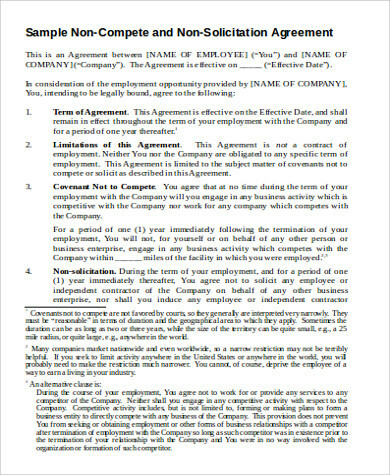 Employers usually issue this document when they want their soon-to-be ex-employee or soon-to-be employee to not work for a position similar to their position in the company, work for a company that is in the same industry, or come up with a startup company that is similar to the company once they are no longer connected with the company. 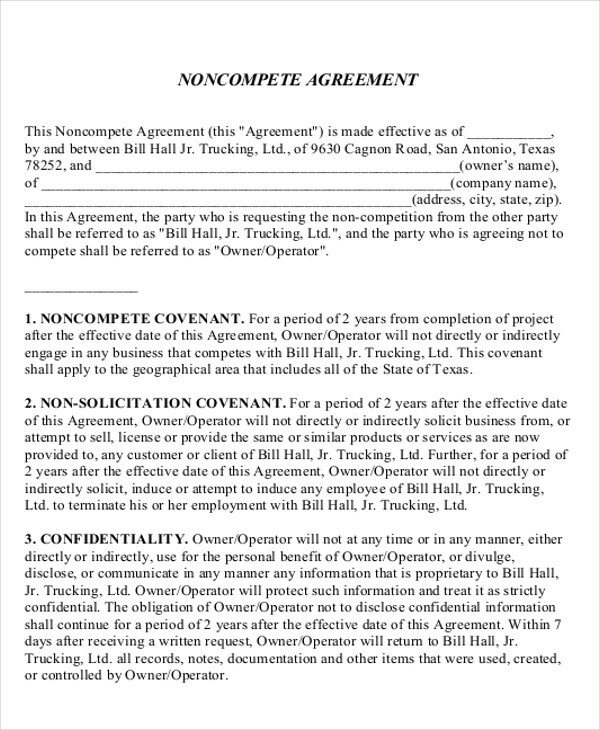 Contractors and consultants are also issued non-compete agreements to ensure that there will be no competition once they break their relationship with the company. 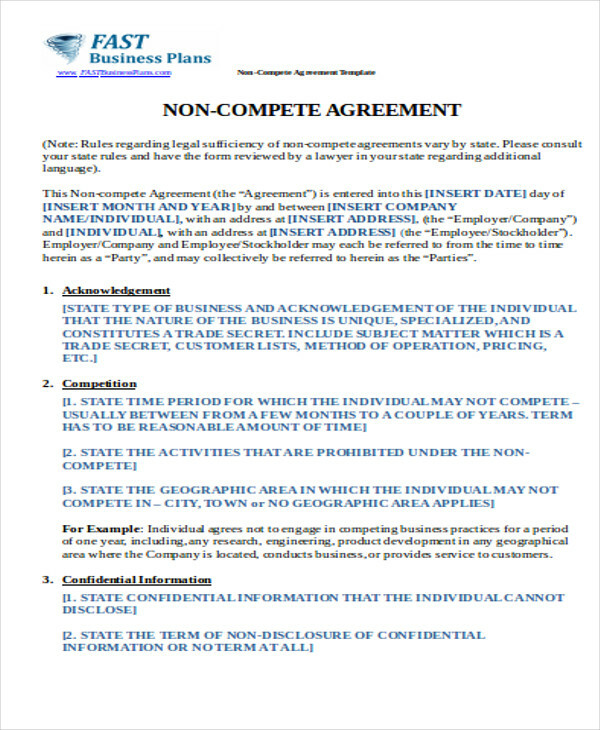 What Is Included in a Non-compete Agreement? 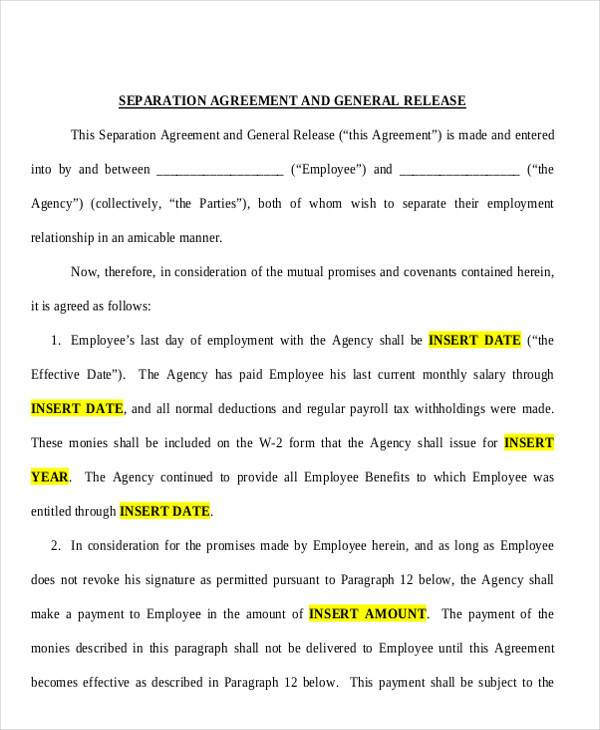 The consideration or money that is due or that the employer should give to the employee for agreeing to the agreement. non-recruitment or avoiding to approach the employees and encourage them to leave their current job. 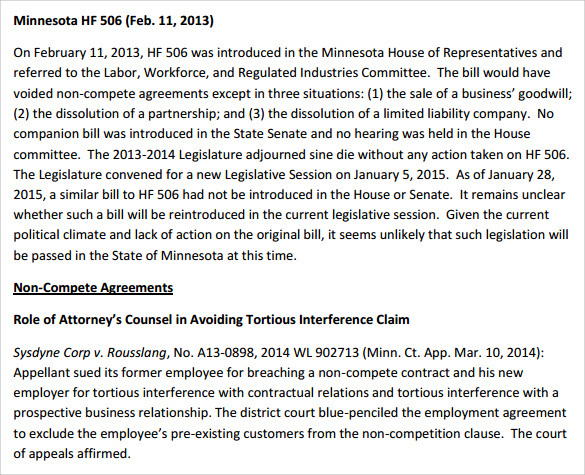 A non-compete agreement starts to become effective upon the detachment of the employee from the company. 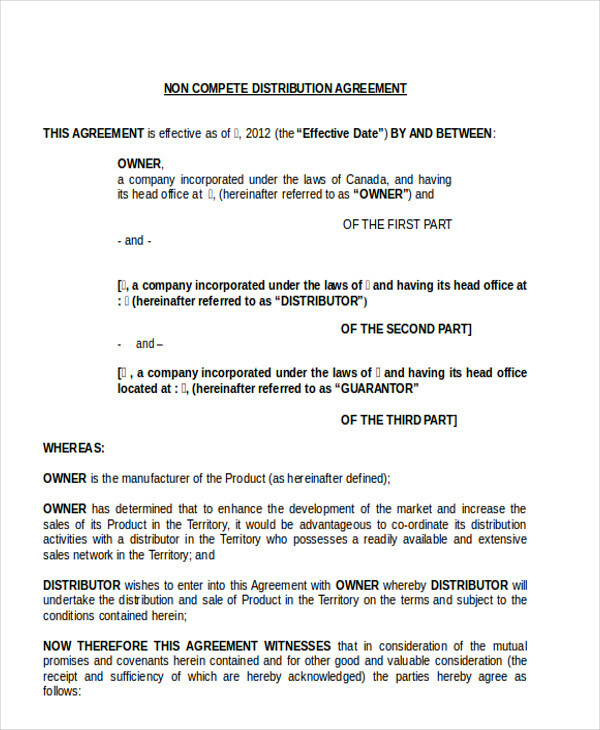 Once the employee has left the company, the agreement is valid for a certain period of time. The validity usually lasts from six months up to two years. The amount of duration depends upon the preference of the employer. 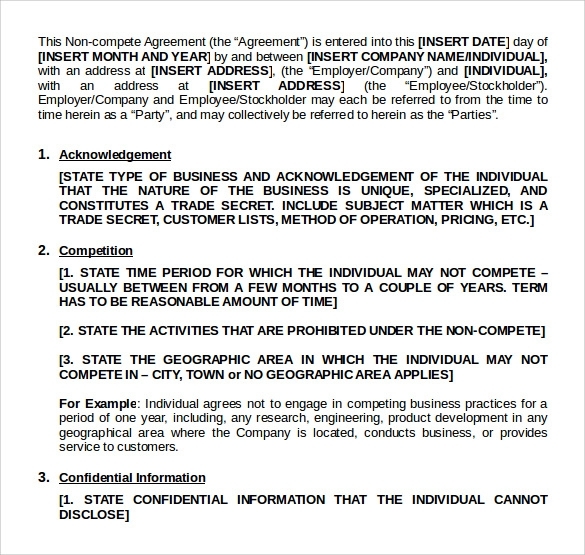 You may also see sample non-compete agreement templates. Setting up the amount of duration should be done in advance. If you are an employer, you have to remember that you also have to set up a duration that is realistic and will be deemed as fair. This is because you cannot prevent someone to pursue their career in the same industry for a long period of time. 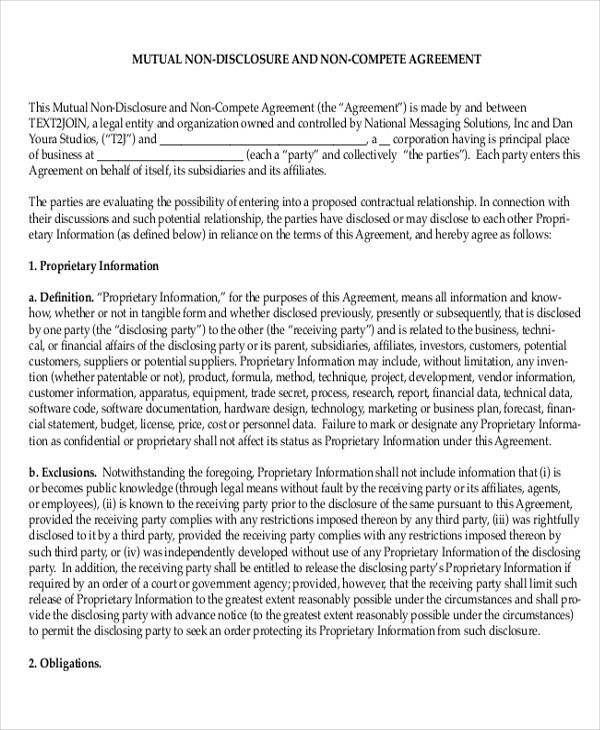 You may also see a simple non-compete agreement. 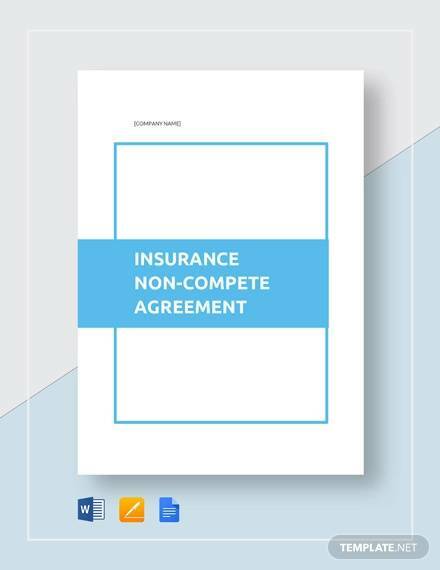 The legal validity of a non-compete agreement varies deeply on the company and the state laws that will cover the non-compete agreement’s clauses. 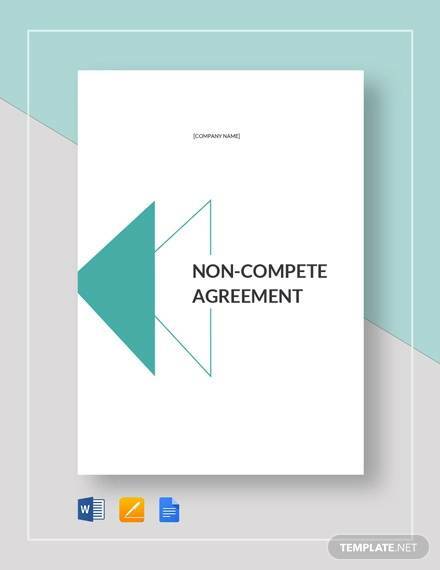 However, non-compete agreements are always considered to be legally binding given that the clauses stated in the agreement are reasonable, clear, and realistic. If you are unsure about the legal validity of a non-compete agreement in your area, make sure that you seek legal advice or check out the state laws that you have that covers non-compete agreements. 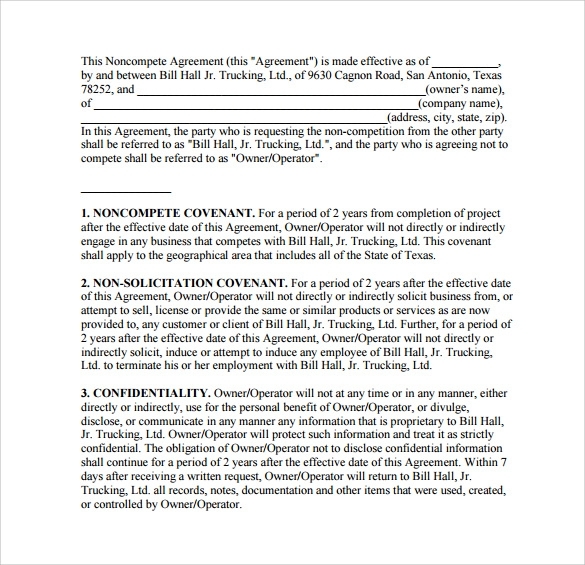 You can find more information by checking out Sample Word Non-Compete Agreements. A legitimate and reasonable reason as to why the employer wants to protect their company. Unfair practices should be avoided. The time period that covers the non-compete agreement should be reasonable as well. State laws do not specify the amount of time limit that a non-compete agreement should have but a common practice is limiting it to, at most, two (2) years. The geographic restrictions should also be reasonable. The region of restriction should not extend beyond where the company is located. Take note also that the geographic restrictions should also pertain to competitive activities and not extend beyond work that is not related to the company industry. 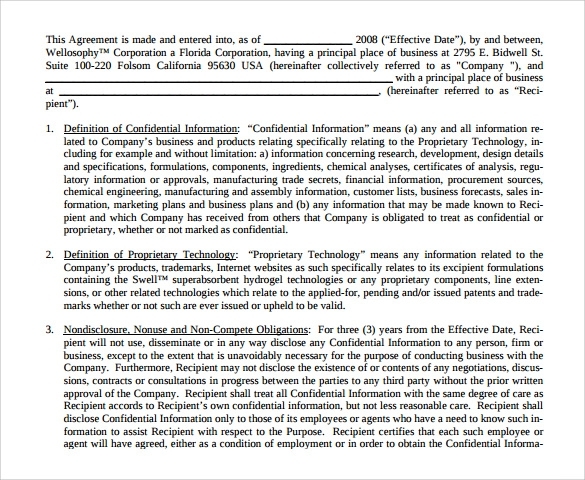 You may also see sample non-disclosure agreements. Restricting the usage of the skills of the employee to find a new job is not allowed. The agreement should not result in a shortage of employees to ensure that possible employees for other industries are not limited and that they would be able to use their skills in other industries. As an employee, you might feel that signing a non-compete agreement will limit your choices for advancing your career. However, a ton of times, you will find that you will be presented with a non-compete agreement and non-disclosure agreement once you have been considered to be a part of the company. You have to make sure that you read the terms and conditions of the agreement and think carefully whether you agree or not with what is stated in the agreement. Signing it will all depend on your discretion. 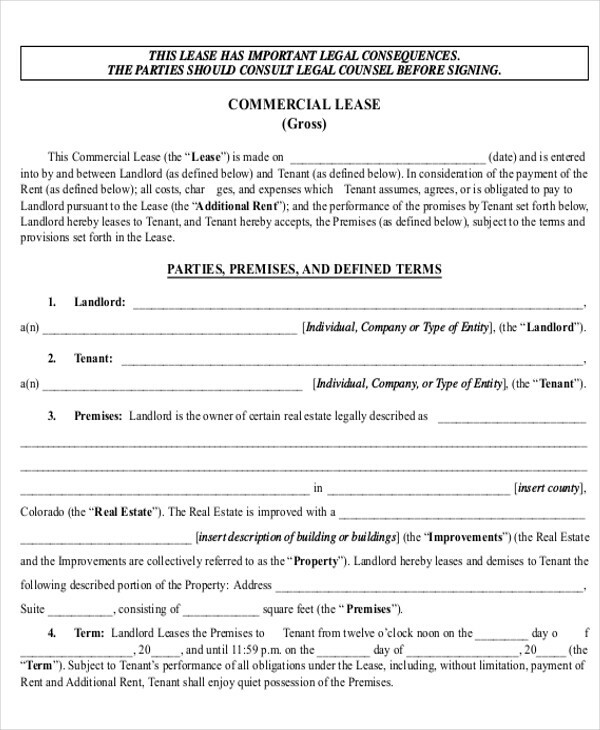 Once you sign it, you will be bound to the agreement once you decide to leave the company. You have now reached the end of our article and we hope you have learned a lot from reading this article. 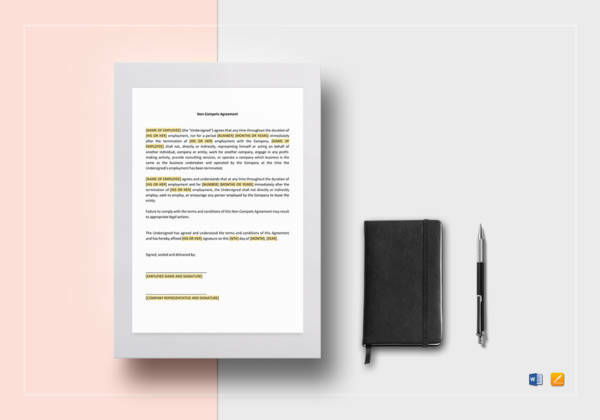 To give you a quick review of non-compete agreements, here are some of the key takeaways that you should always remember when it comes to non-compete agreements. Protection of your business. 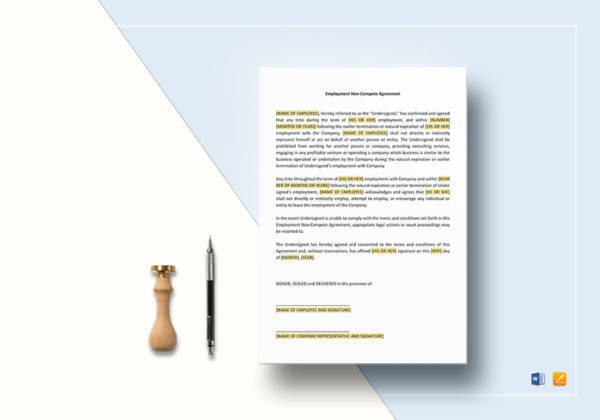 Basically, the main goal of your non-compete agreement is to protect a wide range of aspects regarding your business such as your plans, intellectual property, inventions, and future products. People who come in contact with your business, such as your employees, are considered to be assets, so you want to make sure what they know will not be shared with anyone else, most especially with possible competition. 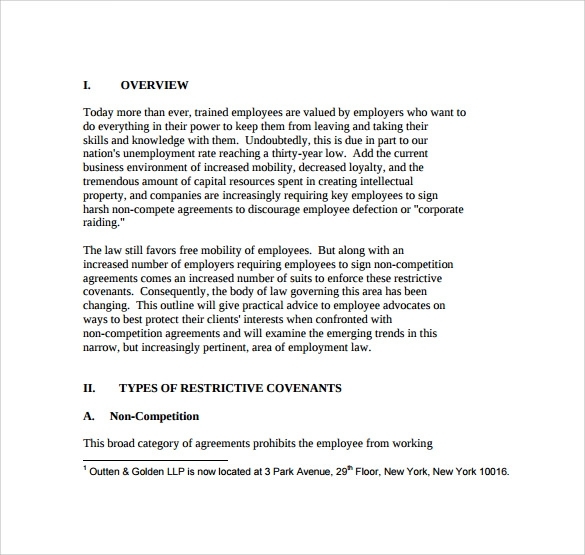 You may also see non-compete agreement examples. Being reasonable is key. Unreasonable time frames and reasons are going to make your agreements unenforceable. So you have to choose your words carefully and make sure that all clauses are fair. 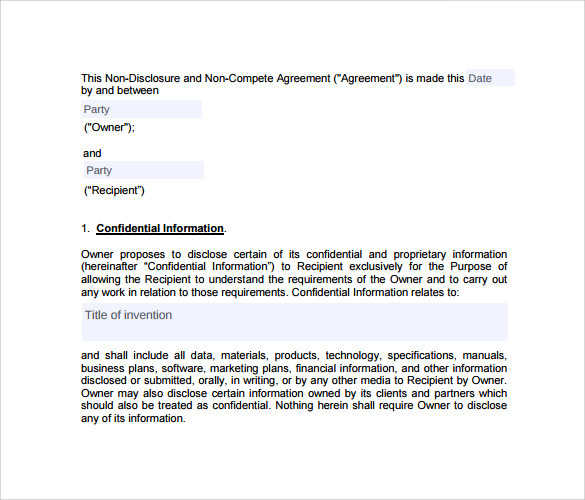 Need more information about non-disclosure agreements? 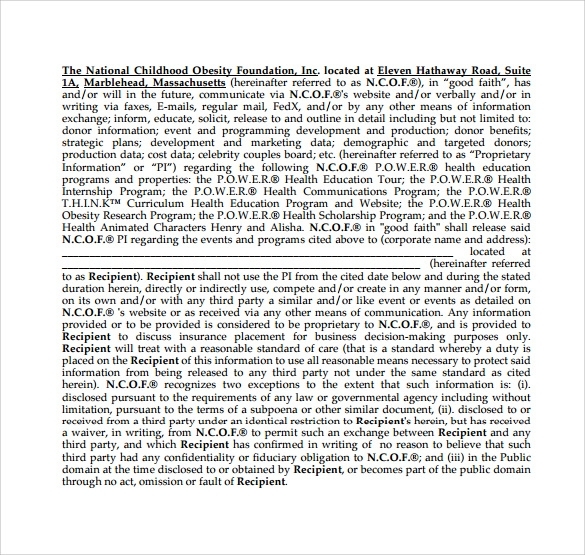 Check out Sample Non-disclosure Agreements in PDF.